During the winter of 1952, British authorities entered the home of mathematician, cryptanalyst and war hero Alan Turing (Benedict Cumberbatch – 'Sherlock', 'Hawking') to investigate a reported burglary. They instead ended up arresting Turing himself on charges of ‘gross indecency,’ an accusation that would lead to his devastating conviction for the criminal offense of homosexuality – little did officials know, they were actually incriminating the pioneer of modern-day computing. Famously leading a motley group of scholars, linguists, chess champions and intelligence officers, he was credited with cracking the so-called unbreakable codes of Germany’s World War II Enigma machine. An intense and haunting portrayal of a brilliant, complicated man, The Imitation Game follows a genius who under nail-biting pressure helped to shorten the war and, in turn, save millions of lives. 'The Imitation Game' received eight Academy Award nominations 2014 including, Best Picture, Best Actor for Benedict Cumberbatch, Best Supporting Actress for Keira Knightley ('Begin Again', 'Atonement') Best Adapted Screenplay, Best Original Score, Best Product Design, Best Director for Morten Tyldum ('Head Hunters', 'Buddy') and Best Film Editing. The 'The Imitation Game' competition has now closed. Winners will be announced shortly. Competition opens at 5pm AEST on Sunday 3rd May 2015 and closes at 11:59pm AEST on Sunday 10th May 2015. Five winners will be chosen at random on Monday 11th May 2015. To successfully win, entrants must fulfil the above entry conditions before the time the competition closes. Current members/followers are eligible to enter the competition. Only one entry per person. Only one winner per household. To be a valid winner, the entrant must not have won a prize from SWITCH within the last 28 days. 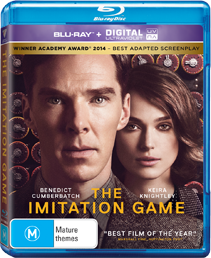 Each winner will receive one Ultraviolet Blu-ray copy of 'The Imitation Game'. By entering, you agree to receive occasional emails from SWITCH in the future. If you decide to unsubscribe from these updates, any further entries will not be applicable. Only Australian residents are eligible to enter. 'The Imitation Game' is available on Digital, Ultraviolet Blu-ray and Ultraviolet DVD on Wednesday the 6th May 2015 from Roadshow.